Gabbar Is Back is an upcoming action Hindi film directed by Krish.It stars Akshay Kumar,Shruti Hassan in the lead roles.Kareena Kapoor Khan will also make a special appearance in the film.It is produced by Sanjay Leela Bhansali and Viacom 18.Gabbar Is Back will release on 1 May 2015. Bollywood is suffering from a very rough phase at the box office.There is not a single clean hit in 2015.We can hope that this fortune changes with Gabbar Is Back. Our expectations from Gabbar Is Back are solid high.Fans are expecting full-fledged masala entertainer like Rowdy Rathore.From the promos it also looks promising. Here is our Gababr Is Back review. The story of Gabbar Is Back has been written by A.R.Murugadoos who himself directed many action films.The film is about Akshay Singh Rajput (Akshay Kumar) who is a professor at a college.In his spare time he goes on coffee dates with Shruti who is a lwayer.He also remembers romancing his wife (Kareena Kapoor).But due to some circumstances he creates his own military network called the Anti-Corruption-Force (ACF).The purpose of this force is to eliminate the most corrupt individuals from all walk of life in a systematic manner.Due to ACF activities pressure builds up on police and government to track down the man behind this group.A politician Suman Talwar is headed the task to track down Gabbar.He is aided by a police constable Sadhu (Sunil Grover).Do police and government be able to find out Gabbar’s real plans,will Sadhu be able to track down Gabbar,or will Gabbar himself come out and expose himself is the story. Gabbar Is Back is a offical remake of hit South Indian film Ramanna and it is directed by Krish who has earlier directed many Tamil films.So Gabbar Is Back has also huge influence of South Indian films.You will might find similarities between Gabbar Is Back and Ungli as the theme of both the movies are same.But you have to applaud Krish director of Gabbar Is Back ,for making an outstanding entertainer. Yes the movie has some over the top action scenes and it is more of a massy film.Yet the movie has a strong message that touches every one’s heart.The movie loses its pace in the first half but picks up later in the second half.The story by A.R.Murgadoos is excellent and Krish manages to do justice with it by his direction.Screenplay could have been a little better while editing is tight.Music of the film works very well with the film. There is no surprise that Akshay Kumar once again delivers a top-notch perfroamnce.He looks amazingly natural and fits completely in the role of Gabbar.You have to admit that in A-list actors there is only Akshay Kumar who is experimenting with his roles in every film. Shruti Hassan has a short screen presence but she looks beautiful when ever she comes on-screen. Suman Talwar in the villain role disappoints while Sunil Grover impresses with his acting abilities.Kareena Kapoor Khan also makes a solid impact in cameo.Chitragda Singh looks stunning in item song. 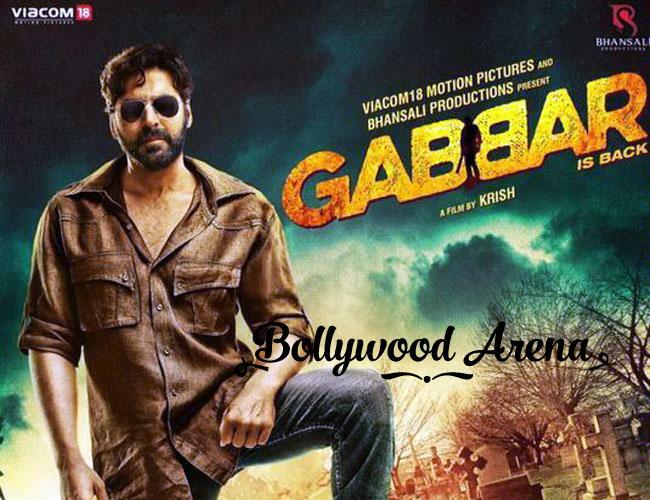 Gabbar Is Back is an excellent entertainer which has high dose of action,drama and comedy.It has all the ingredients for a masala entertainer.Some may find it boring if you are not fan of South films.Once Vidya Balan said that movies are all about entertainment,entertainment and entertainment.This is what Gabbar Is Back is all about pure entertainment.Finally Gabbar Is Back will once again bring people to the cinema halls and will have a huge weekend.You also should not miss this.